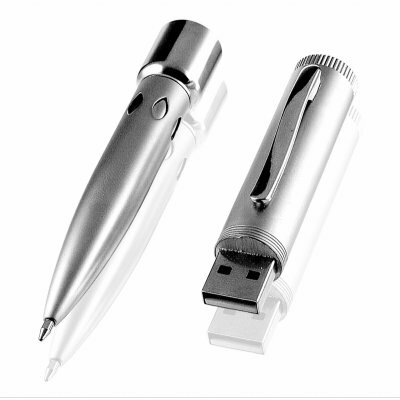 Successfully Added USB Disk Pen 1GB - Solid Metal Body to your Shopping Cart. A 1GB USB flash drive that actually is a working pen! This is what a pen drive should be - elegant and useful! Carry your important data anywhere you go with this business-like metal pen. Simply unscrew the body to reveal the USB connector and plug into your computer to store, copy, move, or transfer files. With 1 gigabyte of memory you can literally hundreds and hundreds of word documents, powerpoint slides, excel files, pictures, and whatever other office files you need to carry back and forth every day. But why bother with carrying around an inconvenient and costly USB thumb drive when this pen can be your flash drive and daily use business pen at the same time! Easy to refill with standard ink cartridges, and super convenient for transporting digital files around, this is a great item for anyone looking to combine old world style with modern technological convenience. In our warehouse right now, so order yours today and be taking it the office with you next week! Makes a great his and her gift! USB connects to all modern computers. Drivers included for older windows systems. this pendrive is one of the best of it's kind,though still expecting to have it but i already have the feelings that it will be good. on 2009-01-04 01:31:02 nice looking and perfect.